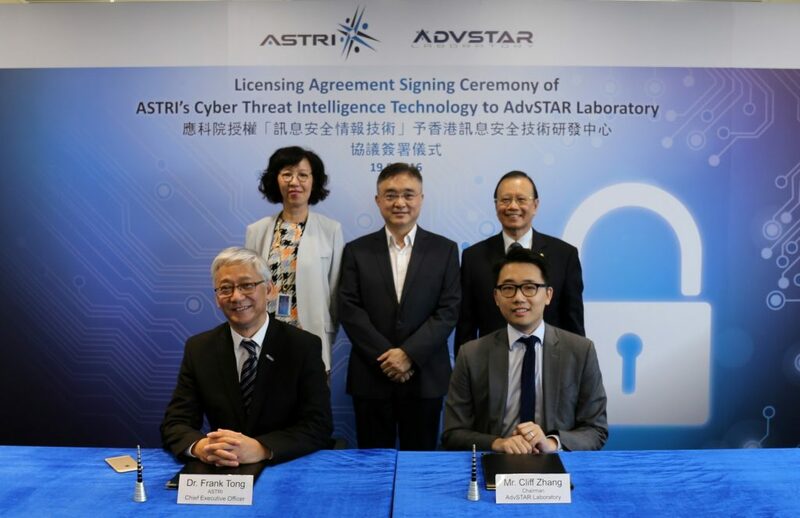 Hong Kong Applied Science and Technology Research Institute (ASTRI) and Advanced Security Technology and Research Laboratory Company Limited (AdvSTAR) held a licensing agreement signing ceremony today (19 August) to license ASTRI’s SecShare Software System to AdvSTAR. The licensing agreement was signed by ASTRI’s CEO Dr. Frank Tong and AdvSTAR’s Chairman Mr. Cliff Zhang under the witness of ASTRI’s Chief Administrative Officer Ms. Elaine Wong, Senior Advisor of AdvSTAR Dr. Lui Sun-wing and Chief Commercial Officer of Hong Kong Science and Technology Parks Corporation Mr. Andrew Young. Dr. Frank Tong, ASTRI’s CEO (front left) and Mr. Cliff Zhang, AdvSTAR’s Chairman (front right) today sign an agreement to license ASTRI’s SecShare Software System to AdvSTAR. At the back are witnesses of the ceremony (from the left): ASTRI’s Chief Administrative Officer Ms. Elaine Wong, Hong Kong Science and Technology Parks Corporation’s Chief Commercial Officer Mr. Andrew Young and AdvSTAR’s Senior Advisor Dr. Lui Sun-wing.